My mother remembered my Great Uncle Joe to be a very kind and gentle person. Again, I am proud of him for his service during World War II. He was the only one of his brothers to be killed at war. The family always kept him close to their hearts. While I have published this post before, I have included material shared by my second cousin, once removed. With gratitude to James Perry for his inquisitive nature and his desire to track family history. His additions are found at the bottom of the post, in blue text. On the Perth Regiment Moro River site, the following description can be read…this, followed by a list of names including that of my Great Uncle. June 22nd., 1944Perhaps the most poignant story of the Perth’s buried at Moro River is the death of Private C. C. Sim. In June of 1944 the Perth’s were withdrawn from the line to rest. During this time a party led by Major C. B. Arrell, and including Chaplain Capt. D. Crawford, Lieut. L.F. Jones and fourteen volunteers, including Private Sim, returned to the battlefield of January 17th, to recover those dead which could not previously be recovered.The battle lines had by this time moved on. In total 19 bodies where recovered and temporally interned at a cemetery located near the cross roads which had been the Perth’s objective in January. Several of those interned where not identifiable and their names can be found on the Casino memorial commemorating those who have no known grave. On the 22nd of June Private C.C. Sim was killed while recovering bodies when he stepped on an s-mine. Another soldier also received wounds from this incident. Private Sim was buried with those he had helped locate and bury. B/41793 PTE. WALTER BOLTON, died on Monday, 17th January 1944. Age 24. Son of Walter and Beatrice Bolton, of Hamilton, Ontario; husband of Ida Bolton. .D/72361 PTE. ALLAN WILBERT CARTLAND,died Monday, 17th January 1944. Age 19. Son of Albert Edward and Mary Ann Cartland,of Montreal, Province of Quebec. .C/36822 PTE. NELSON WILLIS CLARK, diedMonday, 17th January 1944. Age 28. Son of Norman and Agnes Madeline Clark; husband of Hazel Grace Clark,of Peterborough. Grave Reference: III.H.11.LIEUT. ALFRED JOHN CLEMENTS, died Monday, 17th January 1944. Age 23. Son of Alfred and Annie Clements, of St. Thomas, Ontario. L/11313 PTE. WILLIAMS COLLINS,died Monday, 17th January 1944. Age 34. Son of Nickloss and Mary Collins; husband of Callie Gertrude Collins, of Big River, Saskatchewan. Grave Reference: XI.G.3.B/1629 PTE. CECIL COOPER, died Monday, 17th January 1944. Age 20. Son of Harry A. and Violet A. Cooper, of Toronto, Ontario. B/64558 PTE. GLENN COPELAND, died Wednesday, 17th January 1945. Age 23. Son of John Edward and Laurine Effie Copeland, of Toronto, Ontario. A/11663 PTE. JACK BERTRAM CRAWFORD, died Monday, 17th January 1944. A/104789 PTE. GUSTAVE DE BAERE, died Monday, 17th January 1944. Age 23. Son of Alfons and Emilie De Baere, of Bearline, Ontario. A/23090 PTE. JACK WILBERT DURHAM, died Monday, 17th January 1944. Age 23. Son of William Alonzo and Melissa Anne Durham, of Windsor, Ontario. Grave Reference: X.D.3. B/130724 PTE. JAMES BANNERMAN ELLWOOD, died Monday, 17th January 1944. Age 27. Son of A. Ralph and Sybil L. Ellwood; husband of Edith Mary Ellwood, of Toronto, Ontario. H/1561 PTE. PATRICK GALLAGHER , died Monday, 17th January 1944. F/60174 L Cpl. 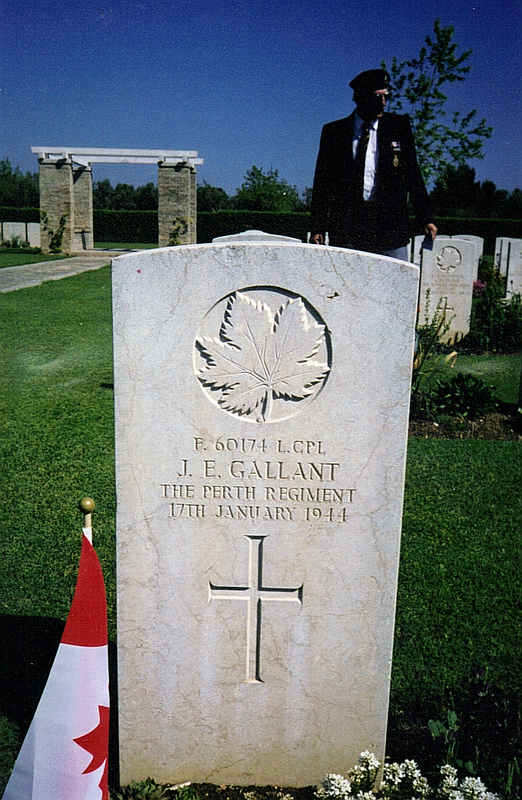 JOSEPH EMANUEL GALLANT , died Monday, 17th January 1944. A/102600 PTE. ANDREW GIBEL, died Monday, 17th January 1944. Age 24. Son of Joseph Gibel, and of Mary Gibel, of Windsor, Ontario. A/49891 PTE. NORMAN LLOYD HURRELL,died Monday, 17th January 1944. Age 25. Son of William and Elizabeth Hurrell; husband of Grace Olive Hurrell, of Chatham, Ontario. L/104669 PTE. JOSEPH LEO KOSTENLY , died Monday, 17th January 1944. C/21739 PTE. AMBROSE LATOUR, died Monday, 17th January 1944. Age 21. Son of Alexander and Marceline Latour, of Mattawa,Ontario. C/34908 PTE. VIATEUR LAVALLIE, diedMonday, 17th January 1944. Age 28. Son of Mary Lavallie; husband of Rose Lavallie, of Joliette, Province of Quebec. B/46946 PTE. JOHN DAVID LAWSON, died Monday, 17th January 1944. Age 21. Son of Frank and Mary K. Lawson, of Rosseau Road,Ontario. A/11490 L/CPL. THOMAS LITTLEJOHN,died Monday, 17th January 1944. Age 21. Son of Harry and Margaret Littlejohn; husband of Rose Ellen Nora Littlejohn, of London, Ontario. B/46937 PTE. SINCLAIR LUDWIG, died Monday, 17th January 1944. MAJOR ROBERT ARCHIBALD MACDOUGALL, died Monday, 17th January 1944. Age 35. Son of Duncan and Flora MacDougall; husband of Helen M. MacDougall (nee Porter), of Westport, Ontario. B.A. (Queen’s University). A/11527 PTE. ALFRED JOSEPH McLEOD, died Monday, 17th January 1944. A/11142 PTE. ARTHUR WILLIAM PRIOR , died Monday, 17th January 1944. Age 28. Son of William Henry and Catherine Prior; husband of Muriel Prior, of St. Catharines, Ontario. LIEUT. LAURENT JOSEPH WILFRID ROCHON,died Monday, 17th January 1944. Son of Joseph Wilfrid Rochon and of Henedine Rochon (nee Lortie), of Sturgeon Falls, Ontario. A/11684 C.S.M. JOHN KERR ROSS, died Monday, 17th January 1944. Age 29. Son of John and Jane Ross, of Toronto, Ontario. A/103220 PTE. DONALD WILLIAM SCHMIDT, died Monday, 17th January 1944. Age 22. Son of Arthur C. and Mabel Schmidt, of Harriston, Ontario. B/46934 PTE. DOUGLAS WARD SMITH, died Monday, 17th January 1944. Age 22. Son of Ernest Ingham Smith, and of Beatrice May Smith, of North Lindsay, Ontario. A/67826 CPL. WILFRED JAMES SMITH , died Monday, 17th January 1944. Age 24. Son of Thomas and Emily Smith, of Stratford, Ontario. A/11256 PTE. WILLIAM RUSSELL STEWART , died Monday, 17th January 1944. A/58052 L/CPL STEWART WILLIAM TILLEY,died Monday, 17th January 1944. Age 24. Son of William John and Violet Tilley, of Wiarton, Ontario. A/11832 PTE. FREDERICK ARTHUR WILLMORE,died Monday, 17th January 1944. B/134857 PTE. HOWARD WILLIAM WOODCOCK, died Monday, 17th January 1944. Age 21. Son of Joel and Manetta A. Woodcock, of Newmarket, Ontario. This is a man who I would love to be able to speak with. I’ve watched a NFB silent black and white film about the battles in December 1943 -January 1944 in Ortona and it saddens me to think about the pain/misery/cold/fear and darkness that these young boys must have experienced. It saddens me that Joseph lost his life nearing the conclusion to this particular battle, on January 17, 1944. In June 2001, our dear family friend, Padre Stan Self, traveled back to Europe, to revisit and pay respects to the many fallen Canadian soldiers who had lost their lives. My parents had shared the name of our uncle and so Stan visited Joseph’s final resting place. Here, I will publish the Commonwealth War Graves Commission Casualty Details as they refer to my great uncle. Thank You, dear angel, Stan. Progress through southern Italy was rapid despite stiff resistance, but by the end of October, the Allies were facing the German winter defensive position known as the Gustav Line, which stretched from the river Garigliano in the west to the Sangro in the east. The Allied force that had fought its way up the Adriatic took the Sangro river positions by 30 November. The 1st Canadian Division went on to cross the Moro river on 6 December against stiff opposition, and to take Ortona on the 28th, after a week of bitter street fighting. The 2nd New Zealand division made some advances further inland but thereafter, there was virtually no movement east of the Appennines until after the fall of Rome. The site of the cemetery was chosen by the Canadian Corps in January 1944. It contains the graves of those who died during that fighting at Moro river and Ortona, and during the weeks that preceded and followed it. In December 1943 alone, the 1st Canadian Division suffered over 500 fatal battle casualties. Burials other than those of members of the Canadian forces are almost all in plots 12, 13 and 16. Moro River Canadian War Cemetery contains 1,615 Commonwealth burials of the Second World War. Information received from my second cousin, by marriage, James Perry, regarding medals. 11 June 1943 and 08 May 1945.
colours represent the colours of the Italian flag. Also, received from James Perry of Summerside, PE are the following notes and references. Thank you for sharing these with our family. Grateful to you, for these contributions, James. An excellent little piece on the background and happenings at Ortona, for our boys. 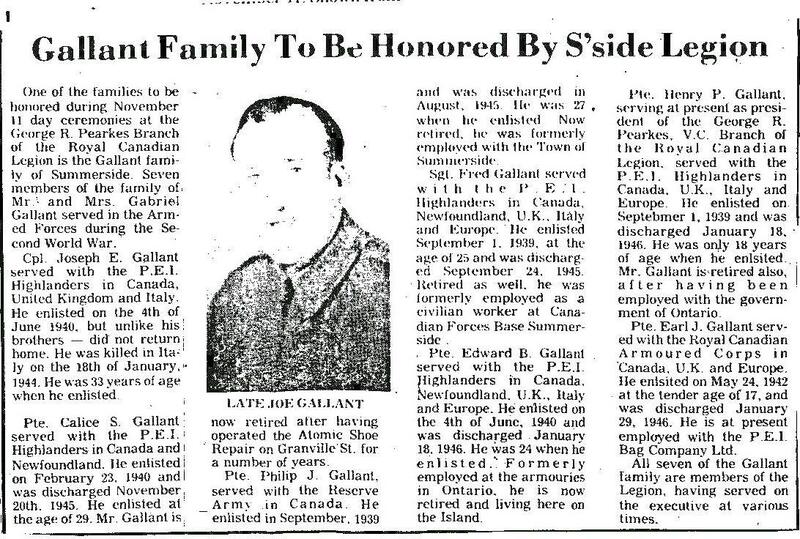 This entry was posted in Family, Words to Live By and tagged Italy, Joseph Emmanuel Gallant, Moro River, Ortona, Remembrance, Soldier, War by Painter Lady. Bookmark the permalink. It’s good that we have yearly remembrances; those who went before us made such great sacrifices.